Spot Light Productions new show, LM Radio’s Top Hits, recalls the history of the glory days of this hugely popular radio station which still broadcasts from Mozambique. The enjoyable programme includes numbers as heard on their Top 100 playlist. 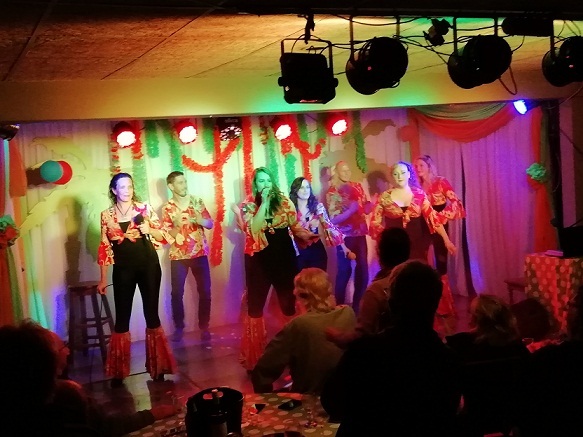 Running tonight and next weekend, the show is directed by Sharon Watters who features in the eight-member cast, which also comprises Caeley van Doorn, Alexandrea Dawson, Dani Cook; Sharon Ditchburn and Shonan Doger de Speville as well as John Bell and Ross Lottering. The company is showing a major improvement since I saw one of Spot Light’s earlier shows. There is better connection with the audience, movement sequences and more suitable costumes. 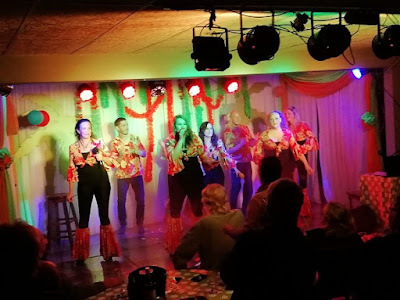 Van Doorn opens the show with a raunchy rendition of Satisfaction, after which the six female vocalists perform effectively as duos, trios or quartets. Numbers that impressed were Radar Love; Rockin’ all over the World; Let It Be; Little Lies; Cotton Fields; Africa and Band on the Run. Originally seen with his shaven head, John Bell undergoes a fascinating transformation with wig and hat to take his place on the side of the stage as an LM Radio DJ. There are the familiar LM jingles and in the style of all radio stations there’s a quiz for the right answers to questions relating to numbers in the show. The other male member of the cast, Lottering, only makes a few appearances but I enjoyed his Layla, and Hey Jude with Doger de Speville and Dawson. 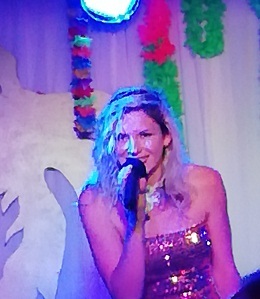 There is joyous audience response for their favourites such as California Dreamin’, Mamma Mia, Stuck in the middle with you; and Spirit in the Sky. Undoubtedly the most stand-out performance comes from Dawson in numbers like a sensual Black Velvet, a poignant and wistful Creep, Final Countdown with Ditchburn, and Piano Man. The set by Ross Lottering consists of a white backdrop decorated with palm images, orange and lime green drapes and hanging feather boas. A few props would be beneficial, such as a potted palm in one corner. With only one access to the stage, it makes a smooth flow of scenes difficult but I felt that more could be made of exits. Sound is by Kevin Lee-Hillier, with lighting by Gabrielle Rio Stow. The back lighting is effective and the show proudly involves the use of a spotlight which makes a great deal of difference to the quality. Once again, I congratulate Spot Light for putting on a production in these difficult times for Durban theatre. I strongly encourage support of Spot Light Productions as I believe they have the capacity and passion to grow and take their place in Durban’s theatre world.